This month, IPA unveils the IPA 100 – the annual list of the largest 100 accounting firms in the country. The analysis culminates in the annual National Benchmarking Report, which is based on responses from more than 500 firms across North America that completed IPA’s in-depth financial and operational survey. If your firm completed the IPA survey, or are a current subscriber to IPA, you will receive the August issue which features the IPA 100 list, the fastest-growing firms, and a discussion of the trends in growth, net revenues, compensation and more, schedule to be released this week. 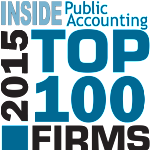 For the complete list of 2015 IPA 100 firms, view an excerpt of the August issue of INSIDE Public Accounting.